Cucumber is a Miracle Fruit!! Botanically cucumbers are classed as fruits. They are not just good as salads and table decorations around your favorite recepies anymore. They are very healthy and nutritious too. Cucumbers are incredibly low in calories. Even though long, dark green, smooth-skinned garden cucumbers are familiar vegetables in the produce sections of most groceries, cucumbers actually come in a wide variety of colors, sizes, shapes and textures. Cucumber's flavor is in their seeds. It should always be taken raw, as while cooking its potassium and phosphorus is lost. Cucumbers are 96% water. Cucumbers contain various vitamins which we need. It includes Vitamin C and K, and minerals like calcium, iron, magnesium, potassium and zinc. 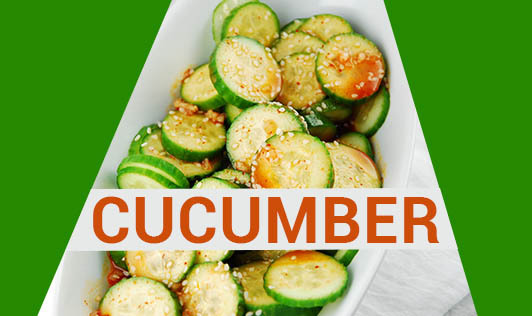 Cucumbers are a nutritious source of vitamins and minerals, and can be eaten on a daily basis. A great deal of those vitamins and minerals are located within the skin of the cucumber, and when it is removed, all of those nutrients are lost. Cucumbers are a good source of potassium, vitamin A, beta-carotene and vitamin K.
Cucumber contains minerals and sodium which helps to regulate blood pressure. Myth: Cucumbers are poisonous scraping their skin with a fork will let the poisons out! Fact: Infact cucumbers are considered more nutritious when eaten with the peel. Myth: Using cucumber slices underneath the eyes fades out fine wrinkles and lines permanently. Fact: : Cucumbers lets the skin around the eyes to hold water, puffs out the wrinkled folds. Wrinkles tend to reappear once the water disperses and the slices have been removed. Add diced cucumber to any of your tuna or chicken salad recipes. Cucumbers can be used as good starter before any meal. Dice cucumbers, watermelon, mangoes and berries for a refreshing summer salad. Cucumbers can be added to low fat curd with a dash of lemon for raita or as sandwich spreader. Thin cucumber slices can replace high-calorie sandwich toppings. Use cucumber sticks or rounds instead of potato chips for your favorite dip. Add grated cucumber to the vegetable parathas. Cucumber can be used for preparing nice chilled smoothie or a hot soup with onions too.